MASTERClass: Plan now to attend our new course starting this coming Autumn! MAY - Graduation & Passing The Baton! heaven knows the church has not taught them one. continue to suckle the lukewarm milk of compromise." Much of the timber of public schooling and evangelicalism is as dry as kindling; Millstones & Stumbling Blocks is an open flame. but in its bold attack on the cherished cultural icon of public schooling. Consequently, my writing may seem intentionally confrontational to those who are intentionally complacent. This book presupposes blindness to the defects and dangers of public schooling. Removing scales from the eyes requires touching the eyeballs, always an uncomfortable proposition. Although the goal is better vision, the process may feel like a poke in the eye; the natural reaction is to close one's eyes and turn away." While America wasn't looking, Reading, Writing and Arithmetic was largely replaced by moral relativism and secular humanism in our kindergartens, grade schools, and universities. This manipulation of the values and beliefs of our young generation is not an accident nor is it due to incompetence. It is a deliberate assault on the spiritual and moral compass of America's children. Dr. Gushta sketches the history of public education and shows how secular approaches have helped give us what one author calls the "dumbest generation" and a system in which some 30 to 50 percent of Christian students leave the faith before graduating from college. She reveals how federal and global bureaucrats are working to make parents helpless bystanders in their children's upbringing. But there is a solution. This solution has to do with being in covenant community. A MUST READ! Thirty years in New York City’s public schools led John Gatto to the sad conclusion that compulsory schooling does little but teach young people to follow orders like cogs in an industrial machine. John Gatto was a teacher in New York City's public schools for over 30 years and is a recipient of the New York State Teacher of the Year award. A much-sought after speaker on education throughout the United States, his other books include A Different Kind of Teacher (Berkeley Hills Books, 2001) and The Underground History of American Education (Oxford Village Press, 2000). J. Gresham Machen, Professor of New Testament at Princeton Theological Seminary, and founder of Westminster Theologicial Seminary and the Orthodox Presbyterian Church, appeared before a Joint Committee of Congress in 1926 to testify in opposition to a federal Department of Education. His foresight, and his defense of Christian schools, is more needed today than it was at the beginning of the twentieth century. These essays and speeches offer a solid defense of Christian education. The erosion of the family, the silencing of the church, the disintegration of morality indicate that America is suffering a cultural crisis, but it is not new. These trends also shaped Nazi Germany. Challenging you to focus on Jesus, Lutzer calls you to stand for truth, justice, and righteousness to stop our country's slide from civility into barbarity. A critical and easy to understand MUST READ! Combines a sound Biblical basis, rigorous research, straightforward, easily read language, and eminently sound reasoning. Whether one is a parent or parent-to-be, pastor, church staff member, or educator, this book has much to offer. It is based, first of all, upon a clear understanding of God's educational mandate to parents. 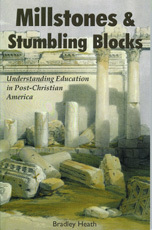 Its second foundation is a thoroughly documented description of the inescapably anti-Christian thrust of any governmental school system and the inevitable results: moral relativism (no fixed standards), academic dumbing down, far-left programs, near absence of discipline, and the persistent but pitiable rationalizations offered by government education professionals. Gatto demonstrates that the harm school inflicts is rational and deliberate. The real function of pedagogy, he argues, is to render the common population manageable. To that end, young people must be conditioned to rely upon experts, to remain divided from natural alliances, and to accept disconnections from their own lived experiences. They must at all costs be discouraged from developing self-reliance and independence. Escaping this trap requires strategy Gatto calls “open source learning” which imposes no artificial divisions between learning and life. Through this alternative approach, our children can avoid being indoctrinated—only then that can they achieve self-knowledge, judgment, and courage. Writing with a keen appreciation for genuine science, Coulter reveals that the so-called gaps in the theory of evolution are all there is—Darwinism is nothing but a gap. After 150 years of dedicated searching into the fossil record, evolution's proponents have failed utterly to substantiate its claims. And a long line of supposed evidence, from the infamous Piltdown Man to the "evolving" peppered moths of England, has been exposed as hoaxes. Still, liberals treat those who question evolution as religious heretics and prohibit students from hearing about real science when it contradicts Darwinism. And these are the people who say they want to keep faith out of the classroom? 1 Chronicles 12:32 - Understand the Times, Know what to Do! Ask almost anyone and you will hear, “Communism is dead! The Berlin wall came down.” But although the word “communism” has fallen out of favor, Marxism continues to have a powerful influence upon our nation, as this new film quickly reveals. Join Idaho legislator Curtis Bowers for a fascinating look at the people and groups that have successfully targeted America’s morality and freedom in their effort to grind America down. Bucking the establishment and it's ideology can cost you your job in academia - never mind what the evidence (or lack thereof) shows. You can't watch this DVD and come way with any confidence K-12 or Academia really values intellectual honesty and truth.